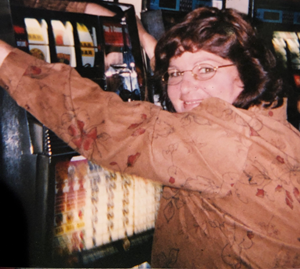 Albany- Maria Bongiorno, 56, passed away Monday, April 8, 2019 with her loving family by her side. Maria was the daughter of the late William and Katherine (Jones) Hausler. Maria was the loving wife to the late John "Bun" Bongiorno and loving companion to Paul Wallace. Maria enjoyed spending time cooking while singing and spending time with her beloved grandchildren. Maria always had a great sense of humor and made people smile. Maria was a "spit-fire" and fought courageously till the end of her time with her loved ones. Maria is survived by her children, Erica (Sean) Tarullo, John (Elizabeth Stone) Bongiorno; her grandchildren, Anthony and Paulie "Bean"; her siblings, William E. Hausler, Lynn (Richard) Harris, Daniel (Pat) Hausler, Brian (Mary) Hausler, Stephen (Cheryl) Hausler, Kathy (Bob) Jones, and several loving nieces, nephews and friends. Maria is predeceased by her brother, Kenneth (Patty) Hausler. Calling hours will be held at New Comer Cremation & Funerals, 181 Troy Schenectady Rd., Watervliet, on Friday, April 12, 2019 from 10:00 am to 12:00 noon. A funeral service will be held at the funeral home at 12:00 noon. Interment will follow the service at Graceland Cemetery, 680 Delaware Ave, Albany. Donations may be made in Maria's memory to Community Hospice, 315 S Manning Blvd, Albany, NY 12208 and The American Heart Association, 4 Atrium Dr #100, Albany, NY 12205. Add your memories to the guest book of Maria Bongiorno. Maria was my first best friend in NY and we shared the lives of our children being best friends growing up together. I will remember how she made everything okay for us daily, she had a grit about her that I drew my strength from to get me through my days as a single mother. I will never forget her teaching me to cook Italian food and sharing many adventures, meals, events, and hardships throughout the time we had together. I truly loved this woman and looked up to her in many ways. I know she will be watching over all of us from above and I will cherish the memories we created and hope her children continue to do their best to share the love this woman emitted to all of us. I love you Erica, Johnny, and never forget she is always with you in this life and the next.